Do you have nosy little ones who love to snoop under the tree for their Christmas presents? Or do you just want to keep your gifts a surprise until the final shred of wrapping is gleefully ripped off? We have all the tips you need to guarantee surprises aplenty on Christmas morning. 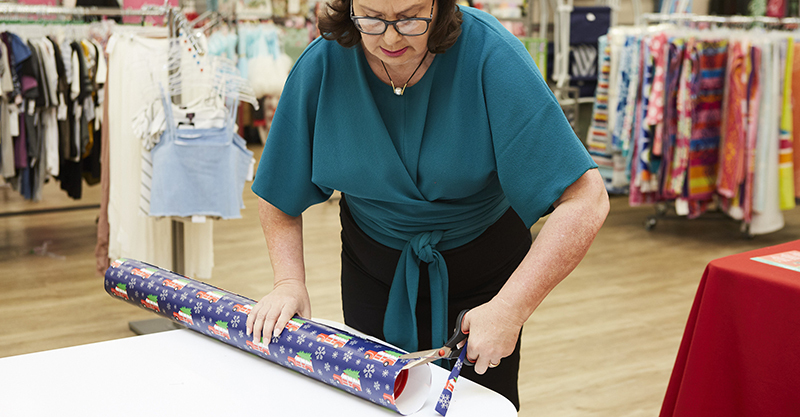 Our editor, Katie, was a guest of off-price retailer TK Maxx, at a recent Christmas gift wrapping tutorial. She selected items as varied as kitchenware, confectionery and linen, from their huge range of hidden gems, to practise her newfound gift wrapping ninja skills. She also asked the best in the gift wrapping business, Vivienne Anthon of The Daily Wrap, to share her secrets for fabulous gift wrapping. Here’s what Vivienne had to say. 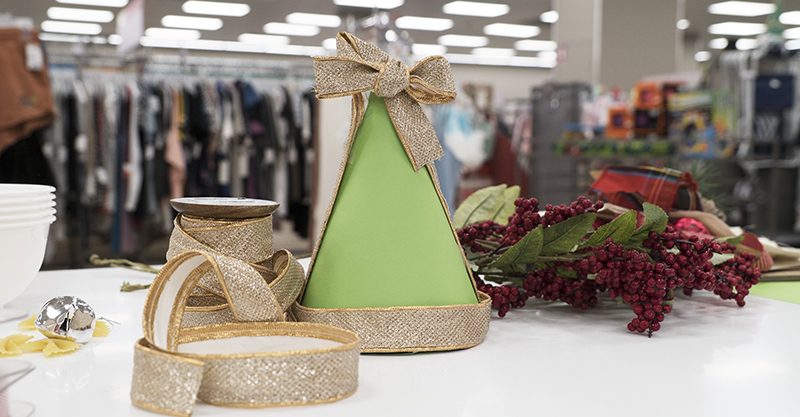 Before you begin, you need to make sure you have all the essentials in your gift wrapping arsenal. a collection of materials to disguise your gifts. The cardinal sins of the gift wrapping world are cutting off too much paper for the size of your gift and then proceeding to hack at it with your scissors. Vivienne says the most common mistake she sees is definitely too much paper. People are worried they won’t have enough so they overcompensate! 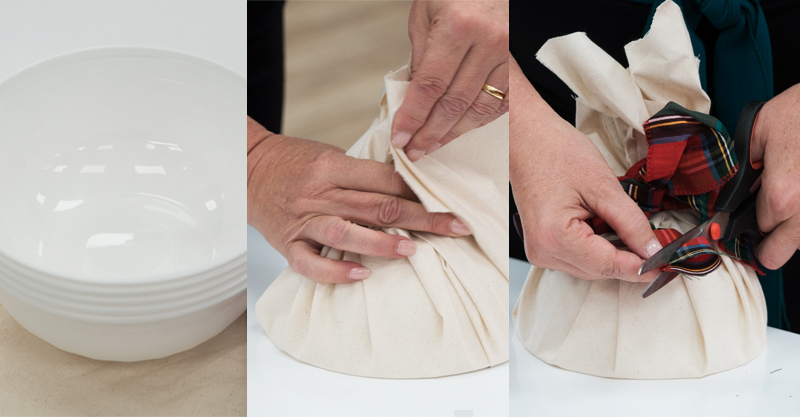 This forces them to either tuck in the excess at the ends (leaving big, scrunchy bits) or to try to cut off the excess in a hurry – with awful results. If you do find yourself in this predicament, neatly trim away the excess by slipping your scissor blades into the fold where the paper edges meet and cut around the gift in a circular motion. If there is one surefire way to keep your kids guessing, it’s to disguise the shape and size of the real gift with a variety of nifty storage items. Vivienne recommends wrapping hard items with an obvious shape (like pencils) inside soft items like clothes, swimmers, and those undies they probably don’t want. Then slip them into a bottle or postal tube to be gift wrapped in the shape of a Christmas bon bon or candle. You can also hold onto those takeaway noodle bowls to fill with smaller toys. Wrap them in a square piece of calico, gathered into a bunch at the top, seal with a ribbon and create the illusion of a Christmas pudding. They’ll be very confused (maybe even mildly disappointed!) until they find the surprise within. Cardboard is also your friend. It can be shaped and cut into just about any size to disguise obviously shaped gifts or even used as a box to hide contents. One of the first things little kids do when trying to guess what you’ve bought them is to shake it! Distracting them with a few mystery sounds is the perfect act of deception. Throw in a handful of mini jingle bells that will roll around and chime merrily from within your gift. You can also include squeaky toys hidden inside soft items, and for hollow hard presents you can hide a few marbles inside to create noise as they roll around. The bigger and heavier the gift is the better, right? Not necessarily – but you can play along with this misconception by making lighter items heavier – just make sure the gift itself isn’t disappointing. Place small, lightweight gifts like earphones, gift cards, stuffed toys, action figures or dolls inside a cardboard box and fill it with a bag full of garden pebbles. You could also hide the items within a heavy wooden box or chest and gift wrap it. Straight after a kid shakes a gift they will inspect how it feels by squeezing and folding it between their fingers or running their hands over its surface and edges. Wrapping gifts in bubblewrap that pops under their heavy-handed inspection, or throwing in a few Christmas decorations in the shape of pointy stars will leave them scratching their heads! Wrap softer items around a bag of pasta and then gift wrap, or place a book inside a bag and fill it with random Lego pieces – the less lying around the floor for you to step on the better! – and then wrap away. They’ll never be able to touch the real gift to figure it out. If all else fails, you can guarantee they will sniff it and that’s another trick you can have up your sleeve. Even the most obvious gift – hello, basketball! – can be disguised by throwing kids off the scent with a lavender-scented drawer pouch, some scented soaps, candle melts, or even some delicious vanilla pods. Waking up to find Santa has thrown back the cold glass of milk and consumed most of the cookies your kids left for him on Christmas Eve is nothing compared to how surprised they’ll be to discover he managed to stash a gift inside their pillow while they slumbered. This will only work with small toys like Lego minifigs. Simply wrap them in some bubble wrap and hide in the underside of their pillow before they get into bed that night. For older kids, you can also take a photo of their gift and wrap it babushka style in a number of boxes and layers of wrapping. On the back of the photo you can write instructions on where in the house they can find the actual gift. We hope these tips help you keep the magic alive for your little ones this Christmas! And remember – don’t cut off too much wrapping paper. TK Maxx sells a huge assortment of big names and top brands at a great discount to what you’d find in a department store. You’ll find a huge range of gifts for the whole family, festive décor, entertaining and outdoor accessories, seasonal fashion and more. To find your closest TK Maxx store, visit their website.